My kids like eating broccoli very much. When they were small, they called this nutritious vegetable as "small trees" because the flower heads arranged in a tree-like shape. They love these "small trees" more than the beef as they absorb all the delicious sauce in this dish. Give this dish a go. Your family will love it too. I just feel the look of broccoli is very appealing and beautiful. Needless to mention its rich nutrients. Yet, not many people like to eat it. In Chinese cooking, people seldom cook them in water then eat because it tastes quite dull.. If it is stir-fried with meat and seasoned with delicious sauce, it could be turned into a super star on the table. 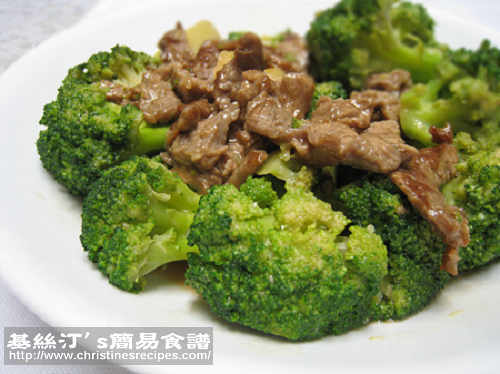 On the menu of Chinese banquet, broccoli could be highly possible there as broccoli is quite expensive in Hong Kong, that is categorized as a luxury vegetable. When it comes to making this dish, don't discard the stem. I often peel off the outer hard skin from the stem. The inner part is quite soft and full of nutrients. Then I'll chop the stem into smaller pieces and cook them with the florets. 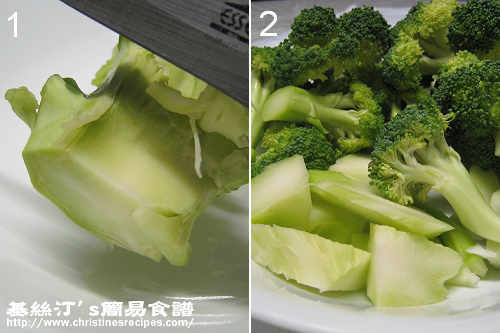 Roughly cut broccoli into pieces. Peel stems as picture shown and put aside. Add 1/2 tsp salt into boiling water. Blanch broccoli for 3 minutes by adding the stems first, then followed by the flowers. Drain well. Set aside. Slice beef thinly and marinate for 15 minutes. Heat oil in a wok or frying pan over medium-high heat and sauté beef until 80% done. Set aside. Add oil, sauté ginger and garlic. Toss in the broccoli. Sprinkle wine and salt, stir fry for a while. Pour chicken stock. Cover and cook until broccoli softens. Toss beef back to wok. Add seasoning. Quickly stir and cook to your preferred consistency. Dish up. Serve with hot rice. Don’t overcook the broccoli, lest they turn yellow and the nutrient inside would be destroyed. Let them just cooked with a bit crunch, with green outside. This is one of my favorite stir-fries. I just can't resist the simplicity of it and how great it tastes. Will be sure to try your recipe soon. I just need to find some Shaoxing wine somewhere, and I should be fine. Thanks for sharing this recipe. I'll be sure to report back and tell you how it went for me. Although I do not take beef but I think the beef will go very well with the broccoli! Absolutely, beef goes very well with broccoli! If you don't take beef, chicken or shrimp are also good choices for broccoli stir-fries. That's great. Every now and then I'd cook this dish. As you said, it never fails. Hey, Christine, just read your comment on my blog. Would you like me to send you the original recipe with the hazelnuts and chocolate? If you can send me the recipe, that's fantastic! Many thanks. I use this recipe and it taste good! Thank you for sharing! Hi Christine, how many servings does this recipe yield? Thanks in advance. Around 3 to 4 people, depending on how hungry they are.